Celebrity psychics abound, but can they really see into the future? There are many famous psychic predictions, but how acurate are they? It's certainly possible for those who can get a glimpse into a celebrity's future to market what they see and become celebrities themselves in doing so. The Hollywood Reporter has hailed celebrity psychic medium Thomas John as "the Hollywood psychic with the highest batting average." You can follow John and keep up with his predictions on his website. In late 2012, John saw "a woman in a white dress falling at the Oscars," accurately predicting Jennifer Lawrence's stumble up the stage stairs at the Academy Awards in 2013. He predicted that Whitney Houston would pass away, including the year that she did pass. Thomas John foresaw the downfall of Harvey Weinstein. John is not very accurate with celebrity death predictions. In 2016, it was reported in the Hollywood News Daily that John didn't have a good feeling about Betty White, Hillary Clinton, Dolly Parton, Michael J. Fox, and Burt Reynolds. These famous folks all survived the year and beyond. Known as "The Psychic Twins," Terry and Linda Jamison are superstars of the celebrity psychic world. You can keep up with their predictions via their website and YouTube channel. Their biggest celebrity prediction happened in 2005 when they predicted that Olivia Newton-John's missing longtime boyfriend, Patrick McDermott, had not drowned but had faked his death and was hiding in Mexico. This prediction was confirmed five years later by NBC Dateline, and later by Patrick McDermott himself. Leonardo DiCaprio would win the Oscar for The Revenant in 2016. In 2007, the twins said Tom Cruise and Katie Holmes would get divorced in five years. The date of the divorce was July 9, 2012. The twins failed when they predicted Hillary Clinton would win the 2016 U.S. Presidential Election. However, most of their failures seem to involve death and timing. In December 2003, the twins predicted the Saddam Hussein would be killed by troops in early 2004. Saddam was captured and tried, and finally executed on December 30, 2006. They also predicted that Pope John Paul II would die in June 2004. John Paul II died on April 2, 2005. Also known as the Music Mentalist, Sidney Friedman is a musician and entertainer who performs at parties and corporate events where he uses his physic talents. He foretold Jennifer Aniston's engagement in 2012, as predicted on FOX TV. In 2013, Friedman said that Kim Kardashian and Kanye West would get engaged. He predicted in 2016 that Prince Harry and Meghan Markle would get engaged and that it might happen a few days before New Year's Eve. In 2016, Friedman predicted new evidence would surface regarding Marilyn Monroe's death, giving credence to speculation it was a murder. That didn't happen. However, it's interesting that Marilyn was resurrected in the media in 2016 when the dress she wore to sing "Happy Birthday, Mr. President" sold for $4.8 million. Lifetime TV named celebrity psychic Michelle Whitedove as America's top psychic after she won America's Psychic Challenge. Michelle publishes predictions on her blog regularly. Adele will announce that she's getting married in March 2017. Nicole Kidman, who has remained silent for 20 years, will finally speak out against Scientology in 2017. She did this in Vanity Fair magazine. Ellen DeGeneres and Portia de Rossi will split. Reese Witherspoon and Jim Toth's marriage will end. Katie Holmes will marry Jamie Fox. 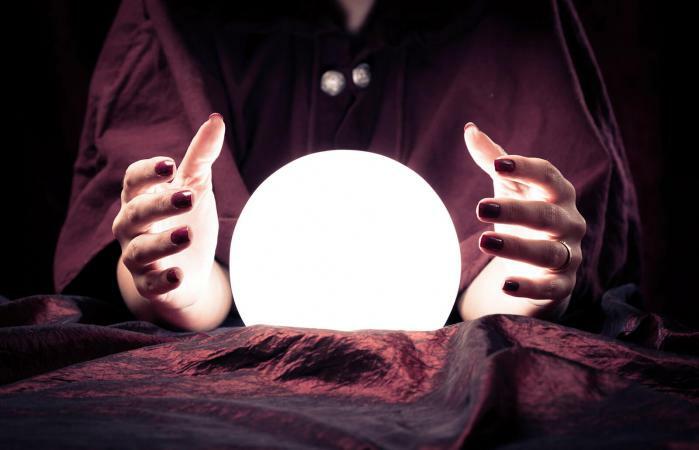 While reading celebrity predictions can be fun, and celebrity psychics provide some out-of-this-world entertainment, skeptics are convinced when a psychic is right, it's just a coincidence. However, even Albert Einstein once wrote that "the separation between past, present, and future is only an illusion, although a convincing one."